Thought of the Day…My cancer scare changed my life. I’m grateful for every new, healthy day I have. It has helped me prioritize my life. ~Olivia Newton-John. October is Breast Cancer Awareness Month. I have had several close people in my life diagnosed with breast cancer. Many are survivors and an inspiration to those in the battle. Unfortunately, not everyone is so blessed. I have lost two very dear people in the breast cancer battle. I’m walking for Mum, Barbara, Dee, Nana, Aunt Velva, Kathy, Gloria and those who still have yet to be diagnosed. To honor my friends and family who have had breast cancer, as well as those who have been touched by breast cancer, I wish to share this video with you. I realize that many may have already seen this (it came out in November 2009), but I hadn’t seen it until this morning. What’s even more embarrassing is that it was created by one of our local hospitals… Not sure how I missed it, but I am so very glad that I found it this month. Even if you’ve seen it, watch it again please. 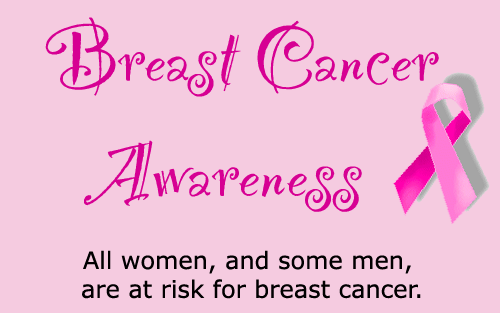 All women, and some men, are at risk for breast cancer. Go to Facts for Life for more information. For more information on breast cancer in men go to Male breast cancer at the National Breast Cancer Awareness Month website. How has breast cancer touched your life? There is a store called Pink Door Boutique here in my area at one of the local hospitals. I found out last night that they have a lot of Breast Cancer awareness apparel but that when you purchase it, it just goes into the general hospital fund, it doesn’t go to Breast Cancer research. I thought that was sad. Oh that is sad!! Sounds like it is time for a letter writing campaign and a call to the paper.